When you change either of the combo box values, the quotient should update. Uncomment the commented-out code behind the form (these are event-handlers which are triggered to run whenever you change the value in either combo box). 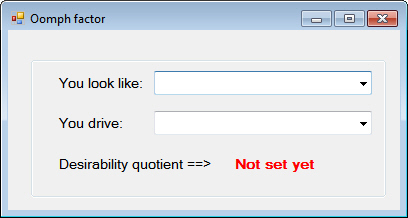 Your program should then update the value of the red label (ie update the value of lblDesirabilityQuotient.Text). Wise Owl do not recommend using this as a basis for partner selection (although you could do worse). Run your form to check that the right message is displayed in all cases!